ESA's Survey Committee "HORIZON 2000+"
NASA SAS-2 experiment (g-ray astronomy). Prototype calibration. Flight data analysis. NASA Einstein Obs. NASA SAS-3, ESA EXOSAT, NASA/ESA IUE. Flight data analysis. ESA GRASP experiment (X/g-ray astronomy) : mission design, study member . P. I. of the ESO Key Programme on Optical Identification of High Energy Sources. Principal Investigator on the EPIC (European Photon Imaging Camera) on XMM-Newton, ESA cornerstone mission. A European Collaboration of 13 institutes in four nations. ESA XMM/Newton: P.I/Co-Pi of several proposals. Flight data analysis. Initiator within Italy of the Cherenkov Telescope Array ultrahigh-energy Gamma-ray Astronomy project (CTA), one of the ESFRI priorities. GFB has been involved in scientific space projects and their management from his thesis (1968) until today. He contributed to every European (and many U.S.) space mission in astrophysics, and was active in promoting and directing space research in Italy, France and Europe in general. Since his first missions - ESRO’s TD-1 (1968-72) and NASA’s SAS-2 (1973-5) - his scientific and management roles continuously increased. For ESA’s first satellite, COS-B (1975-1982), he represented Italy and was later mission Data Reduction Coordinator (1981). In parallel, he led the Italian hardware participation to the Franco-Soviet Gamma-1 mission (1981-1986). In 1987, he was selected as Principal Investigator for the main focal plane instrument of ESA’s cornerstone mission in X-ray astronomy “XMM-Newton” (flown in 1999). He named the instrument EPIC (European Photon Imaging Camera) and was its P.I. until 1997, leading the European collaboration of a dozen institutes (more than 100 scientists and engineers), four National Space Agencies and many industries to a delivery on time and within budget (about 50Meuro). After more than 16 years in orbit, EPIC is arguably the most science productive X-ray astronomy instrument ever flown. Starting in 1983, he was a member of various scientific advisory bodies of ESA, NASA (GRO), CNES, COSPAR and ASI, taking part in agencies policy-making and mission selections such as that of ESA’s INTEGRAL, for which he chaired the Payload Selection Committee. (INTEGRAL has been in orbit since 2002, and is highly successful). 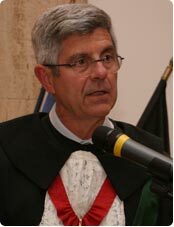 In 1997, GFB joined the Italian Space Agency (ASI) as Director of Science, a position he held until 2002. In that capacity, among other duties, he started a series of scientific missions, the first of which, AGILE (a SMEX-class mission), has been doing breakthrough gamma-ray astronomy since it ins launch 2007. He was also responsible for the Italian-Dutch X mission BeppoSAX (1996-2002), well-known for its discoveries on gamma-ray bursts. The ASI Science Directorate budget was about 50 Meuro/year, plus the responsibility for the Italian participation to ESA’s Science Programme. At ASI, GFB was thus also responsible for approving Italy’s policy for ESA missions (e.g. PLANCK/ HERSCHEL) and for starting an important collaboration with NASA’s SWIFT and FERMI, both successfully in orbit since 2004 and 2008, also thanks to the Italian participation. From 2003 to 2006, GFB was Director of the Centre d’Etude Spatiale des Rayonnements (Toulouse), one of the most important French space science laboratories (over 120 scientists and technicians, about 10 Meuro/year budget), including management of hardware contributions, data analysis of missions and interactions at al levels with the French CNRS and the French and European Space Agencies. 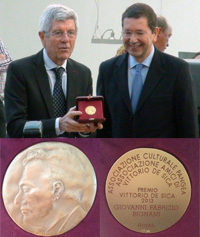 In April 2007 he was nominated by Prime Minister Romano Prodi as President of ASI. ASI had a budget of 800 M€/y and was ESA’s third largest contributor. As Head of the Italian Delegation in ESA, GFB was instrumental in supporting all European space research and applications. He also strengthened ASI’s collaboration with NASA for several missions, including HST and FERMI. At the end of 2008, the Max-Planck Gesellschaft nominated GFB to the Evaluation Committee for the selection of the Director for their Institut fuer Extraterrestrische Physik, Garching. In 2009, the Italian Research Minister nominated GFB as Aerospace Coordinator for Italy’s National Programme for Research. In 2010, the Agence d’Evaluation de la Recherche et de l’Enseignement Supérieur (AERES) nominated GFB as President of their Evaluation Committee for the CNES (French Space Agency). He also acted as an expert for the French Agence National de la Recherche. In July 2010, the 44 Member States elected GFB (first Italian) as President of COSPAR, the worldwide Committee on Space Research, which has been planning and evaluating world space research since 1958, acting for the UN thorough ICSU, the International Council of Scientific Unions. As COSPAR President, he was responsible for two General Assemblies, in Mysore, India (2012) and in Moscow, Russia (2014), the latter requiring some political skills in a difficult international context. In August 2011, GFB was nominated, for a 4-year mandate, President of INAF, the Italian National Astronomy Institute, with 17 Institutions nationwide, a budget of over 100 Meuro/year and a personnel of about 1,200. One of the first moves of GFB at INAF was to ensure, within the European Southern Observatory (ESO), the Italian participation to the European Extremely Large Telescope (E-ELT), the biggest future programme in optical astronomy from the ground. Since 2012, Italy, through INAF, is a full partner of EELT. This has already generated a very important return in terms of contracts to Italian industries and to INAF Institutes, for an amount significantly bigger than Italy’s investment in the project. In June 2013, GFB became Head of the Italian Delegation, responsible for Italy’s 12% contribution to ESO. At ESO, GFB was asked to serve on strategic science and project-developing Committees, notably for the ELT. In 2013-2014, GFB was part of the ESA selection process which led to the choice of ATHENA Plus as the next of ESA’s L-class missions. As a consequence, at INAF GFB has started a programme of basic research and development for the Italian contribution to the instrumentation of this great mission. During 2014, at INAF, GFB has secured increased financing for Astronomy in Italy’s National Budget Law through a special addendum dedicated to a programme of “Industrial Astronomy” of 30 Meuro for 2015-17. In parallel, he is starting a programme of privileged European Investment Bank loans possibly reaching 20 Meuro/year for 10 years. Through such financing, significantly increasing INAF’s standard budget, since 2015 Italy’s participation in the CTA and SKA programmes has become a reality. In July 2015, by unanimous vote of the ten member countries, GFB was elected Chairman of the Board of the SKA Organization. The Board is responsible, among other things, for overseeing the scientific design, at both hardware and software levels, of the SKA radioastronomical instrument, a > billion euro project. GFB was instrumental in developing gamma-ray astrophysics as a new high-energy discipline. After taking part, in the early seventies, in the understanding of the diffuse gamma-ray emission from our Galaxy in terms of cosmic-ray protons and electrons interacting with interstellar gas, and in the first detection of a gamma-ray pulsar (the Crab, 1974), he later (1981) led the work yielding the discovery of the first extragalactic gamma-ray source, the QSO 3C273. He took part (early eighties) in the original discovery of the population of gamma-ray sources in our Galaxy, and, in particular, his research (1973-1993) on the identification and understanding of Geminga (which he named) as the first of a new class of gamma-ray neutron stars remains a template until today. He led the X-ray and optical observations as well as their interpretation. Combining, over the last 15 years, gamma- and X-ray astronomy (using the XMM/NEWTON mission), optical and other types of data, the observational and interpretative work of GFB’ group has yielded a number of important first results, like the first in situ measurement of an isolated neutron star magnetic field, the first evidence of high-energy particle acceleration by a gamma-ray pulsar, the tracking of a neutron star rotation from its thermal surface emission, the first optical parallax of a neutron star (Geminga) and the optical proper motion determination of several other neutron stars. The most important optical results on Geminga were obtained from 1993 to 1996 thanks to HST GO observations, with GFB as the PI, also correlating them to HIPPARCOS data for absolute astrometry. Currently, GFB participates also in the analysis of data of the AGILE and FERMI observatories, now showing that many of the galactic gamma-ray sources, unidentified for decades, are in fact “Geminga-like”, i.e. isolated neutron stars only emitting gamma-rays. Moreover, he took part on the discovery of gamma-ray variability of the Crab pulsars as well as of gamma-ray emission from the CygX3 microquasar. In 2008, GFB, exploiting INTEGRAL data, contributed to another first result in high-energy astronomy: the gamma-ray evidence for the galactic antimatter content, interpreting it as being due to neutron stars in special binary systems, located in the central regions of our Galaxy. In 2013, GFB co-authored the discovery of the most intense magnetic field so far observed in a celestial object. The result came from a combination of X-ray astronomy data and a study of the detailed physics of a magnetar, or a special type of neutron star. GFB stimulated, and continues today, theoretical work based on high-energy astrophysics data. From 2005 until today, theoretical work of GFB explored the possibility of quantum vacuum lensing and quantum vacuum friction (QVF) around magnetized neutron stars, discussing the creation of light pseudoscalar bosons and predicting their observability in a specific neutron star-neutron star binary system. In a similar vein, his group also explores QVF-related physical limits to neutron stars fields. Currently (2015-2016), GFB is working on a model capable of explaining some apparent anomalies arising from the VHE/UHE gamma-ray data of the extragalactic population of AGNs seen at high-energies. One possible interpretation leads to the presence of axion-like particles for energy transport. In 2016 he joined a collaboration of Italian scientists in creating a Project (PRIN CTA/SKA) dedicated to studying future multiwavelength observations from the ground in radio- and gamma-ray astronomy(SKA,CTA) and from space in x-ray and soft gama-rays (Integral, Athena). GFB is a strong believer in presenting science to a wide audience and is active in science policy and in opinion making as an interdisciplinary science advocate towards governments and the public. A scholar and language enthusiast, GFB loves humanities as much as sciences. In Italy, GFB has written over 400 newspaper (Corriere della Sera, Il Messaggero, Il Sole, La Stampa, La Repubblica, etc. ), magazine (e.g.Le Scienze) and encyclopaedia (e.g Treccani) articles. Currently, he has a rubric on the weekly l’Espresso and contributes to La Repubblica (frequently on the front page): about 30 pieces in 2016. He has created and talented several TV series, for RAI (as a guest of Piero Angela on RAI 1, GEO on RAI3, etc.) and for National Geographic Channel, Italy. (see samples in www.giovannibignami.it) He has also worked with the ESA and CERN TV programmes, and with Antenne 2 in France. Worldwide, he is a regular contributor to Nature (27 pieces), Science (18), the McGraw-Hill Encycl. (3), and he contributed to the opinion page of the International Herald Tribune (7). Against the Donning of the Gown, the first English version (in jambic pentametrs) of a long (301 lines) poem written by Galileo Galilei in 1590 (Moonbooks, London, 2000, reprinted Pisa, 2009). This work stands as a concrete testimony of GFB’s literary interests. L’esplorazione dello spazio (Il Mulino, Bologna, 2006). I Marziani siamo noi (Zanichelli, Bologna, 2010), now published in German (Wir sind die Marsmenschen, Spektrum, 2012), French (Des etoiles et des hommes, Cherche-Midi, Paris 2012), English (We are the Martians, Springer, Berlin, 2012), Chinese (Science Press, Beijing, 2013) and Iranian (2014). A new, fully revised edition is imminent (2016). Il futuro spiegato ai ragazzi (Mondadori, 2012, reprinted 2013), with C. Bellon, now published in Spanish as “El futuro explicado a los ninos” ( Siruela, Madrid 2014). Three of GFB’s books, i.e. : I marziani siamo noi, Cosa resta da scoprire and Il mistero delle sette sfere, have all been rendered for the TV in Nat Geo and RAI serials. GFB is also currently very active in science popularization programmes in various RAI Channels, also in collaboration with the Accademia dei Lincei, and other National and International Channels.